I have a confession. I’m really a vegetable lover. When it comes to meat, it better be savory and it better be tender! This recipe meets both requisites with ease. We are fortunate to have great resources for grass-fed beef in our area, such as Woodbridge Dairy in Byron Center, Michigan. 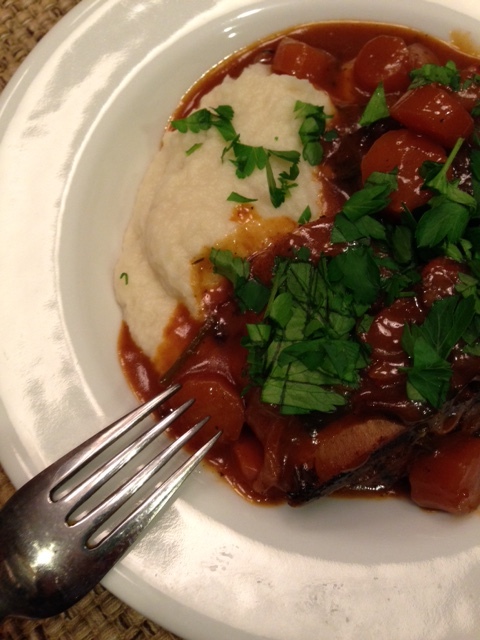 With beef short ribs there are two different cuts available: English-Cut and Flaken-Style. When I develop recipes, the biggest challenge for me is to measure amounts to duplicate the result. I have decided that the Paleo approach is a template that each of us decides to what degree we follow. For example, wine is a beautiful meat tenderizer, the alcohol evaporates during the cooking process; so you will find dry red wine in this recipe. It is up to you whether or not you adjust for it. I also don’t use the flour often recommended during the browning process. Instead I used tapioca, which is gluten-free to help thicken the sauce. I also serve it over mashed cauliflower instead of the typical mashed potatoes, to help keep it in the Paleo realm. The result was well received. Please feel free to share your thoughts and/or adjustments for this approach. 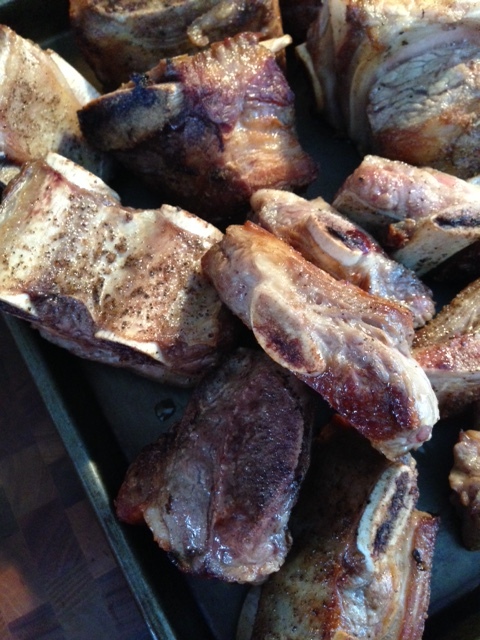 Preheat oven to 300 F. Dry short ribs and season liberally with salt and pepper. Heat a Dutch oven to medium-high. Add olive oil and brown all sides of beef ribs in a single layer (about 12-15 minutes total). Set a side. Repeat with the remaining ribs. Lower heat to medium. Add celery, shallots and carrots to oil and saute for 3-5 minutes, or until shallots are soft. Add garlic and tomato paste. Stir to blend, about 2 minutes. 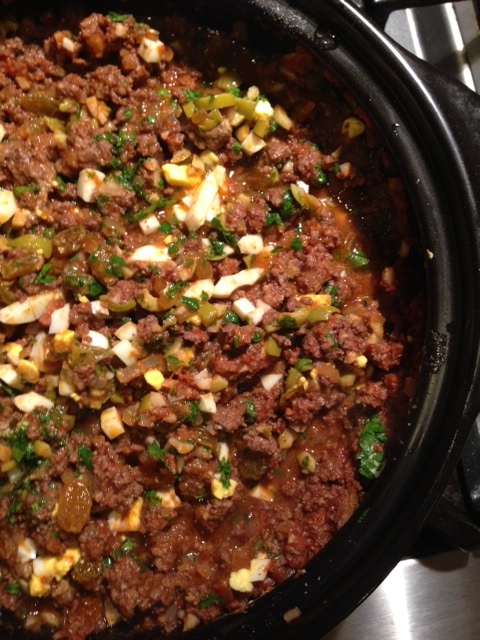 Add Aleppo chili, thyme, bay leaves, stock, wine, and Tapioca. Bring to a simmer. Place beef ribs on top of sauce. Turn to coat. Place in oven, covered for 3-4 hours; pulling out each hour to turn ribs in their sauce. Cook until fork tender. Put a dollop of cauliflower mashed potatoes in a shallow bowl. 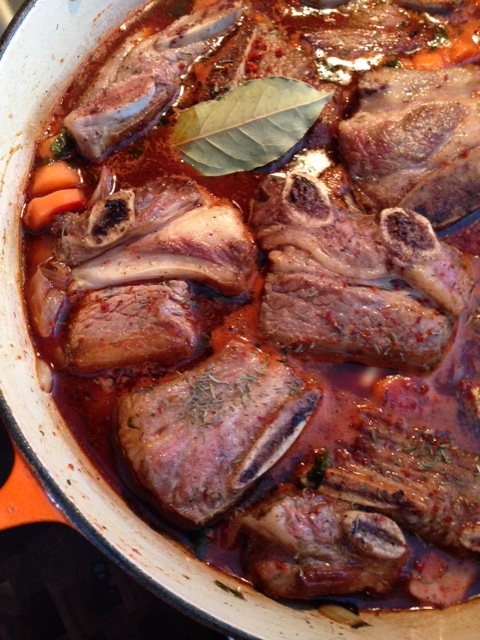 Top with one or two ribs, sauce and sprinkle with chopped parsley. Drain cauliflower and add it to the bowl in a food processor with ghee, salt and pepper. Process until smooth. “I just don’t have the time!” The lament of so many busy people. Yet, what are we spending our time on? The average American spends 4-6 hours per day in front of the television; not to mention, computers, games and phones. Ok, I do like my techno gadgets, but I love good, wholesome food more. Cooking has become a spectator sport. We love to watch, but don’t participate. But I’m here to tell you, cooking can be fun, entertaining and therapeutic. Get everyone into the act. I call my family and friends who want to help in the kitchen: “my sous.” We laugh, we joke and above all we eat well. We manage to find time for the things that are important to us. There are so many meals that simply don’t take a lot of time. Soups, stews, salads can all be eaten for multiple days, or frozen for future use. In the time it takes to have a pizza delivered you can have a healthy meal on the table. Preheat oven to 450 F. Position rack in center of oven. In a large bowl, combine squash and pear slices with olive oil. Toss well and transfer in a single layer to a jelly-roll pan lined with parchment paper. Sprinkle with a little Kosher salt. Roast, flipping with a spatula halfway through and rotating the pan until they are soft and caramelized; approximately 20-25 minutes. Set aside. Toss the greens with 2 Tbsp of the warm vinaigrette, salt and place on a platter or individual plates. 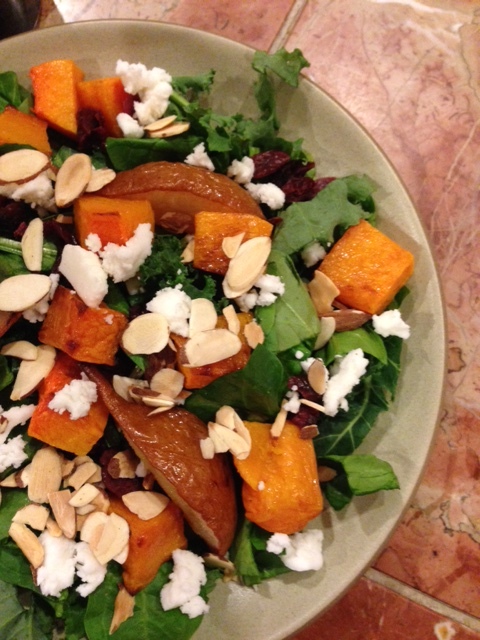 Scatter the squash cubes and pear slices on top, then sprinkle with almonds, tart cherries and feta. Pass extra dressing. Heat the oil in a small skillet over medium heat. Add the shallots and a little salt and saute, stirring occasionally, until softened and lightly browned. Remove from heat. Let cool for 5 minutes. Meanwhile, in a small heatproof bowl, whisk the vinegar, maple syrup, lime juice and zest, mustard, and a few grinds of fresh pepper. Whisk the warm oil into the vinegar mixture until emulsified. Season to taste with more juice, salt or pepper. Proof that salads can be fresh and roasted. Opposites attract! It’s always a little disconcerting, but change is hard. I did things a certain way for so long that when the need arose to upend my culinary avenues, I experienced a certain sense of loss. When this feeling would raise its ugly little head, I would repeat the following mantra, “Don’t cling to the past, embrace the new!” I needed to set my “Curious George” free. So I did. Similar to learning a new instrument, a new sport, a new hobby; cooking within certain parameters didn’t have to be boring. I also recognized that my personality and sensibilities also needed to be acknowledged. For example, my addiction to snacking (particularly crunchy, salty) would have to be addressed. I found that the “out of sight, out of mind” approach worked well after I got through the first 2 weeks. I also had healthy choices on hand, like apples with almond butter, when I needed a snack. I have always chaffed under restrictions, so I didn’t want to follow some plan like a religion. This requires that I honestly evaluate how I feel after each meal. Even the new can lead to healthy habits over time. I would need to befriend: patience and persistence. The past week here in southwest Michigan, has been bitter cold. 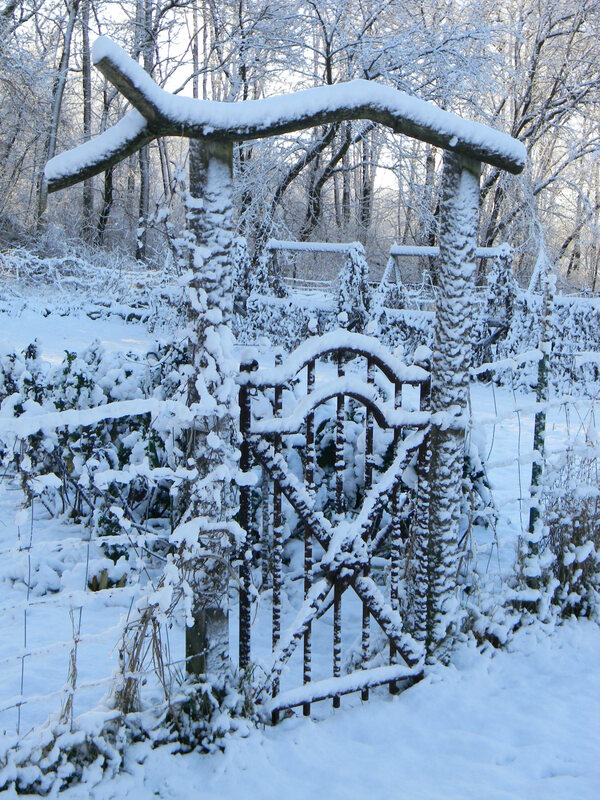 With wind chills as low as -25 degrees, our wood-burner has been working overtime. Soups and stews were definitely on the docket. We stocked up on winter squash in late fall at the farmer’s market: butternut, spaghetti and acorn. I’m particularly fond of butternut. Its so versatile. 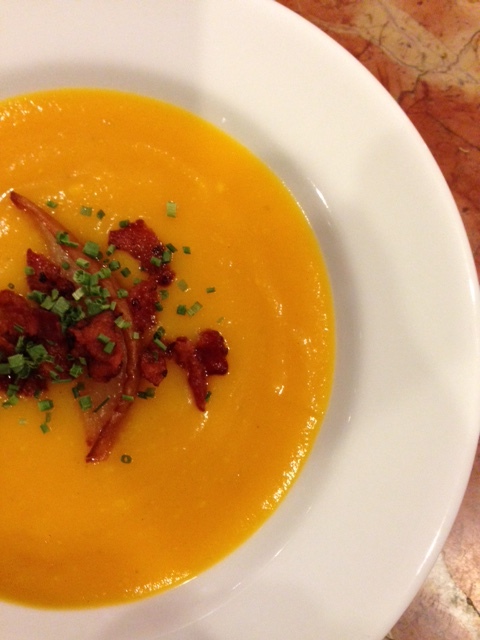 When it comes to soup, butternut is my go to squash. Typically made with Granny Smith apple to accentuate its inherent sweetness; I always lean toward the savory. I also prefer to roast the butternut, rather than boil it. It takes a little longer, but the depth it creates is worth it. I nestle in some Bosch pear slices while I’m at it as an unexpected garnish; and the oven helps keep our kitchen warm. 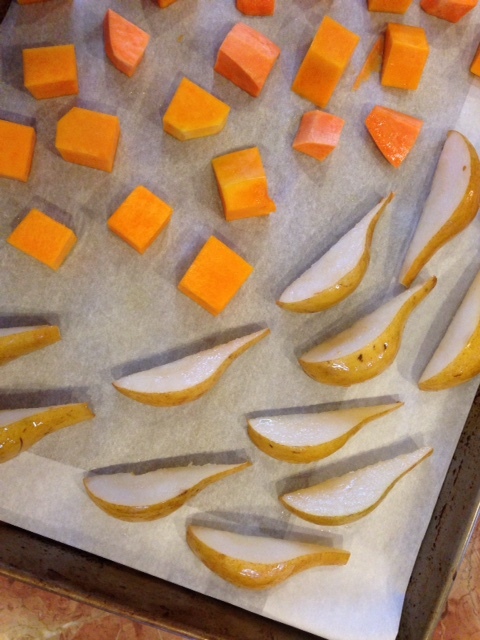 Cut two butternut squash in half from top to bottom, remove seeds, rub cut sides with olive oil and place cut side down on a jelly-roll pan lined with parchment paper. Bake for 50-60 minutes or until soft when pierce with fork. Let cool. Scoop out flesh from each half and puree in blender or food processor in batches with chicken broth. Set aside. 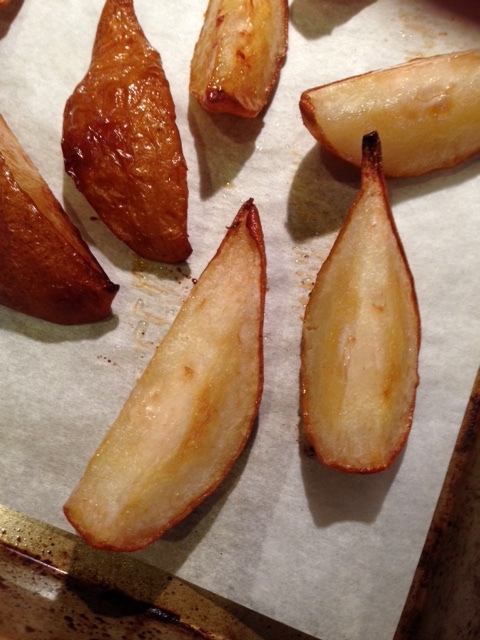 Roast Bosch pear on parchment paper for 20-25 minutes until soft and caramelized. Set aside. Heat small dry skillet on medium-high. Add cumin seeds and toast until fragrant and slightly browned, about 1-2 minutes. Grind in mortar and pestle. Set aside. If mortar and pestle is not available, use ground cumin. In large pot or Dutch oven, heat 1 Tbsp ghee (clarified butter) or olive oil on medium heat. Add shallots and saute until soft about 3-4 minutes. Add garlic, cumin, ginger, salt, cinnamon and Aleppo pepper and saute an additional 2 minutes, being careful not to brown. Add pureed squash, chicken broth and apple cider vinegar to pot. Simmer on medium-low until heated through. Serve in individual bowls. 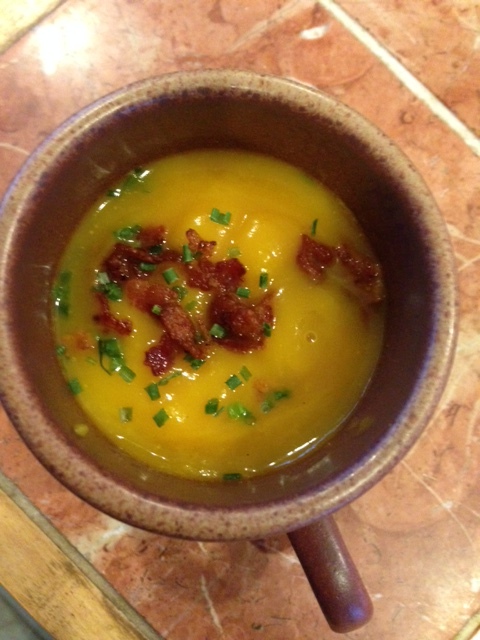 Garnish each bowl with a slice of roasted pear, sprinkle with bacon and chives. Food. Humans have been obsessed with it since the beginning of time. It defines us geographically, ethnically, culturally and economically. It has been a focus in my life since I made my first pie at age 10. It is my vocation, entertainment, art form and passion. As a vegetable farmer, I felt I was eating a balanced diet of the recommended vegetables, whole grains and proteins. Needless to say I was shocked when I had a life-threatening intestinal bleed-out in June of 2014 the repercussions I’m still sorting out. What should I avoid? How do I prevent it from happening again? When I discussed the food connection with my gastroenterologist, he was unconcerned since my tests proved inconclusive. One thing I have learned since my health crisis, is that the medical profession for all of its wisdom, does not largely advocate diets that address the symptoms of the diseases they treat. They adhere to their protocols using prescription medication to treat symptoms of disease, rather than the possible genesis of the disease through diet. It was clear, that my partner Val and I would need to be proactive with our own research to help determine how I could avoid future frightening episodes. We started reading in earnest, books such as Wheat Belly by Dr. William Davis. The mere word ‘diet’ can sometimes freak me out. Would I have to do this forever? No artisan bread? None the less, we decided to go gluten-free. Then came the shocker: within 48 hours, my brain fog disappeared! I had learned to live with its slowness for well over a decade, chalking it up to menopause or the aging process; but it was gone and has not returned. Really? My thinking was so clear that I became an evangelist for the gluten-free lifestyle. Although at one time I thought gluten-free was an over blown food fad, here I was subscribing to its tenants. As we continued to connect the dots, our investigating lead to the Paleo Diet. Now mind you, for a foodie like myself, I was nervous that I would not find enough variety to sustain this approach. And could we just stop calling these approaches diets? Paelo….my god is there material here! Dozens and dozens of cookbooks, plans, pod-casts and blogs. Still…I have, and continue to have reservations about its restrictions: no grains, no legumes, no dairy. But like most things in my life; I jumped in with both feet. Rather than focus on what I couldn’t have, I focus on the variety I do have. When I consider the abundant approaches of ethnic food, I knew I would put my creativity to the test! 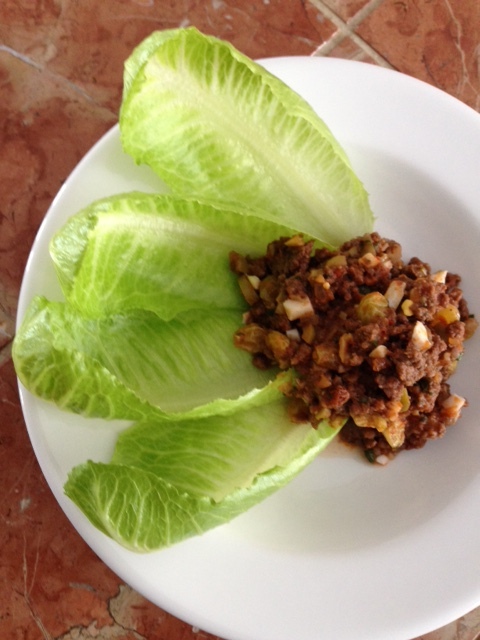 To that end my first recipe is a take on a Cuban Beef Picadillo. I used our own roasted tomatoes, but you can use Muir Glen Fire Roasted Tomatoes with almost equal success. It’s great over roasted spaghetti squash or as a lettuce roll-up. My food future certainly seems less bleak. Bon Appetite! Perfect as a filling for tacos or a wrap. Preheat oven to 375 degrees. Rub olive oil on cut sides of squash. Place on jelly-roll pan, covered with parchment paper, cut side down. Roast for 50 minutes. Set aside. Heat the oil in a large skillet over medium heat. Add the ground beef and cook, stirring occasionally and breaking up the meat with the edge of a spoon, until no longer pink, about 5 minutes. Add the wine, onion and garlic; cook stirring occasionally, until wine is almost evaporated, about 5 more minutes. Add the tomatoes and raisins and simmer, stirring occasionally, until the liquid has almost evaporated, 2 to 3 minutes more. Season with salt and pepper. Remove the skillet from the heat and stir in the chopped eggs, olives, and cilantro. 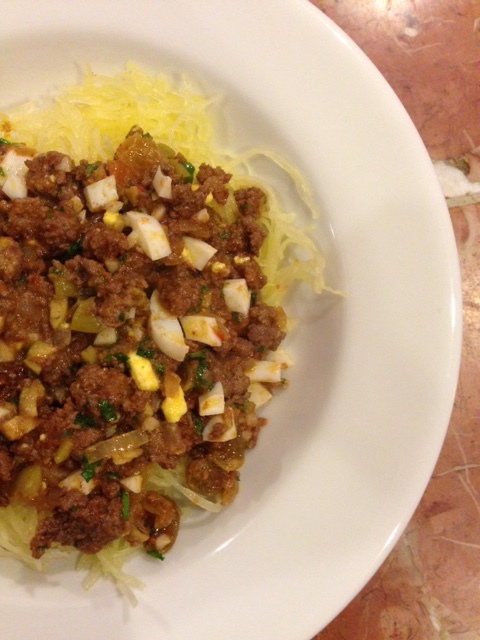 With a fork, scrape some of the spaghetti squash into individual bowls. Top with sauce. After having an upper GI and a colonoscopy, the results proved inconclusive. I was tested for celiac disease and for a wheat allergy; these tests were negative. We did not know the reason for my bleed-out. It was suspected that it was more seepage over time, since I had not noticed any continual discoloration in my stool. Yet, I wanted to know….why? How could I prevent a reoccurrence of a frightening episode? Questioning lead me down unexpected paths, which fostered this blog and the sequel to Basics with a Twist. Walk with me on this journey of discovery as we see theTwisted Basics in our food-system and our health. Within my life–threatening crisis, is also a life-giving answer. When you ask hard questions, be prepared to have many of your common beliefs turned upside down, paradigms challenged and an invitation to accept responsibility for your own health. As my physician said, “A test is a snap shot in time. Listen to your body and it will inform you if you are on the right track.” I realize how I have been taking my body for granted. The time has come to take responsibility for its health. This is a story of that journey.